There are over 285 million tires discarded annually in the United States and 1-3 billion are currently in landfills. About 75% of the discarded tires are placed in landfills annually, and though they represent only 1% of municipal solid waste, they are not biodegradable and pose significant environmental problem. 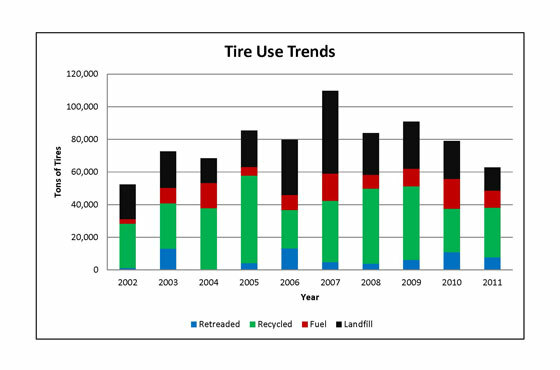 The scrap tire recycling industry in the United States has grown rapidly since 1986. For more than quarter of a century, the tire recycling industry has explored ways to use recycling tires as a raw material in manufacturing new products. These innovations have turned what might have been a waste into a specification grade recyclable industry. Every two weeks, Americans wear almost 50 million pounds of rubber off their tires. That’s enough to make 3.25 million new tires from scratch. 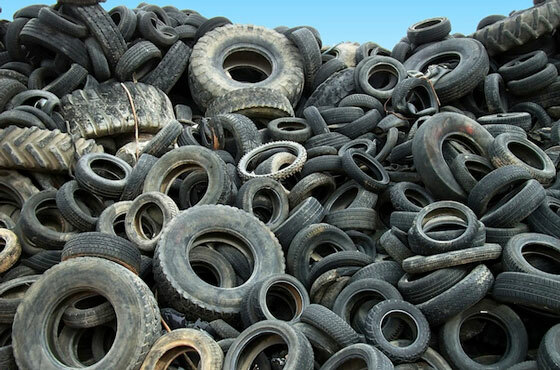 The Environmental Protection Agency reports 290 million scrap tires were generated in 2003. Of the 290 million, 45 million of these scrap tires were used to make automotive and truck tire re-treads. The United States has decreased the number of waste tires in storage from 700-800 million in 1994, down to 275 million tires in 2004 primarily due to state scrap management programs. In Maryland, you pay a fee of $.80 as recycling fee when you buy a new tire. Funds collected from the tire fee support Scrap Tire Program that is dedicated to ensuring the cleanup of illegal scrap tire stockpiles and to managing the collection, transportation and processing of the scrap tires. Consider that the average American family owns two cars with four tires each which need to be replaced every two years. In Maryland, that adds up to almost 5.5 million new scrap tires each year requiring proper disposal. Any person who transport, collects, processes, recycles, disposes, incinerates, or utilizes scrap tires as tire derived fuel will require the appropriate license. Pyrolysis is process of molecular breakdown where larger molecules are broken down into small molecules. 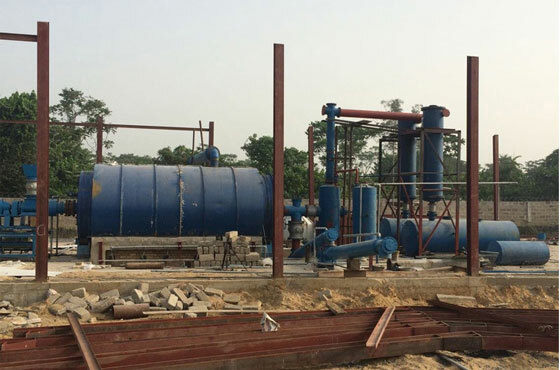 Pyrolysis plant is an industry designed to carry out pyrolysis of waste plastic &tires. In case of plastic & tires pyrolysis, long chain polymer is broken down into smaller chains of hydrocarbon gas and pyrolysis oil. Heat and catalyst are required for the following reaction. The main oil product produced by recycling application is the fuel oil, which is wide used for industrial and commercial purposes. The oil has 40%-45% of the amount of recycled scrap tires, which will be carried with licensed tanker trucks. Carbon black is the main product recycled by the pyrolysis technology. The amount of recycled carbon black is 30%-35% (depending on the type of tire) of the total amount of scrap tires recycled in the system. Carbon black is used as raw material or main ingredient in many industries and the chemical structure of carbon black strengthens, lengthens the endurance, and improves the coloring features of the materials. Tires contain steel wires, the amount ranging from 15% to 20% of the total tire weight. All of the steel present in the tire can be detached after the pyrolysis recycling process is completed. Valuable steel wires are pressed and sold to steel and scrap dealers. 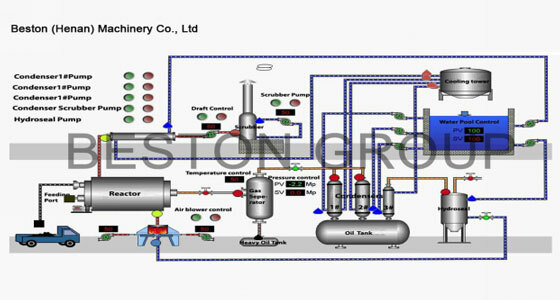 * Can be used as energy resource in gas burners, also used in pyrolysis system. The amount of gas generated in the system is 5 to 7% of the total amount of recycled tires and considering the 9 ton scrap tire/day recycling capacity, the facility generates 1400 – 1500 m?/day gas which has an enormous energy potential when evaluated. 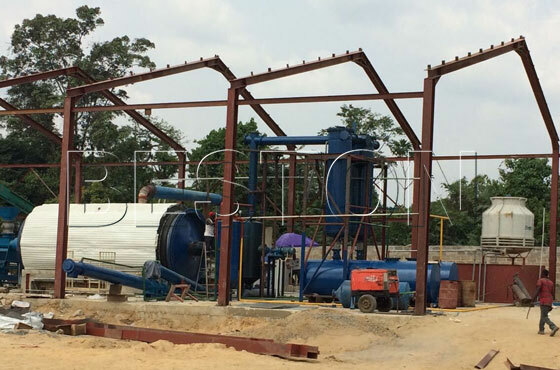 * 90% waste tire recycling will be achieved (no churn left after the process). * No chemical ingredients are used in the process (the process is completely environmental-friendly). * During and after the process no soil, water or air pollution is observed. * The process creates economically valuable products out of waste (all of the products are industrial raw materials that have a market value). * The most cost-effective waste tire recycling technology in the world. 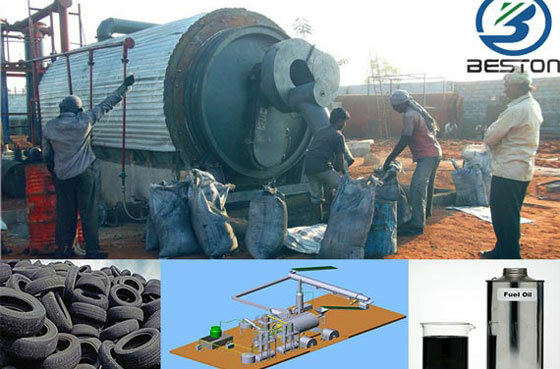 * Raw material (waste tire) is cheap and easy to provide. These are the by-products of tire production. * Each recycled ton of tire preserves 9 tons of CO2 that is a major greenhouse gas. * The process can be applied to all rubber based materials. * The system creates an alternative source of energy to replace petroleum products and natura lgas. * The system gives the opportunity to governments and local administrations to deal with the waste tire problem to a great extent. 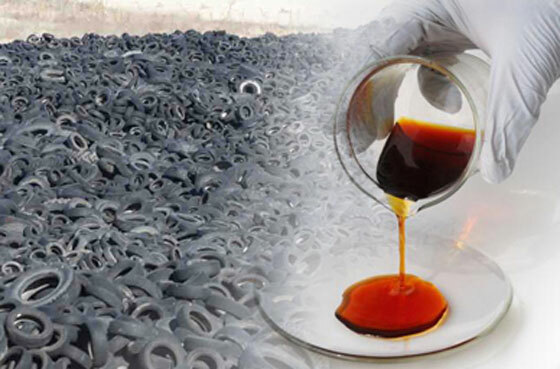 * The system prevents the spread of diseases caused by waste tires..
* The process of Pyrolysis has duration of 4 to 12 hours, depending on the amount and type of tire (car tire, truck tire, etc.). During the process different vacuum values are applied in pre- determined temperatures and in different phases different gases are obtained and the condensed gas is stored as fuel-oil in tanks. ·Land area should be minimum of 5 acres. ·Should have enough space for an inventory of raw material for 9 days. ·Office should be able to handle a staff of 25-30 people. ·Project should be completed and close-out within 18 months. ·Project should not exceed its budget. 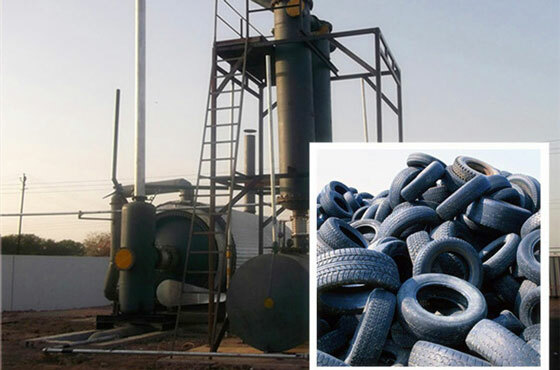 ·The plant should be able to recycle 10 tons of tyres per day. ·The plant will need an electrical supply of upto 30 KW per day while in operation. 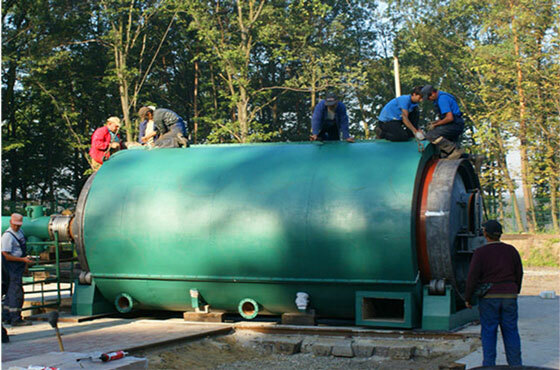 ·Should be able to storage capacity of 20,000 ltrs of oil. ·Should be able to store 520 tons of shredded tyres. ·Concrete slab should be able to hold the 50-60 ton of machinery & vibrations while working also. ·Structure should have enough emergency exists in event of an emergency. ·Should have enough fire alarms installed. ·Smoke detectors to be installed in every room. ·Should include all other safety equipment’s too depending on the need. During the Engineering Development phase, all staffing will be in accordance with the second sub task breakout of the WBS. During the Construction phase, all staffing will be in accordance with the third sub task breakout of the WBS. During the Closeout phase, all staffing will be in accordance with the third sub task breakout of the WBS. All work during these three phases will be contracted out. Each group will have a team lead that reports directly to the PM. These team leads will manage the budget, schedule, resources and staff under them. Any changes to their contract must be approved beforehand by the PM. The Administrative staff will be headed by an assistant PM, who will report directly to the PM. The materials needed for the construction of Tire recycling plant will be determined during the design process. The materials used to construct the plant must remain within the designated cost for materials and production. All materials will be acquired in accordance with the Acquisition Plan. The purpose of making this acquisition plan if to obtain all required materials for the construction of scrap tire recycling plant in Maryland through various contractors in Maryland and around DC on time without any schedule or cost delays. The plant has to fulfill its deliverables as mentioned already in the report. We would be setting up the new plant at a new place so we will need to acquire all the materials needed for its building on time. It will include everything from architecture designing, construction of the facility & warehouse, getting the machinery set-up, also all other aesthetics also like water supply equipment &electrical supply and other amenities also. For acquisition of these materials we will need to use COTS & for acquiring the machinery we will need to give out contracts through selection procedure as also discussed in report. The whole set-up needs to be in line with all the environmental conditions & rules applicable in the area as per the government. The set-up should have enough infrastructures for its working like access through industrial roads & even if through railroads. It should have enough capability to process the minimum amount of tire recycling per working hour of the plant. The completion of the project as stated earlier in scheduling & it should be completed within time. The cost of the plant should also exceed its budget. All the waste materials during this construction have to take proper care of & waste water used should be treated & cleaned before dumping off. The cost of acquiring all the materials required should not exceed $250,000 as mentioned in the budgeting of this report. We reached to this figure through extensive research of the other similar project studies. The cost of acquiring the architectural designs for the plant should not exceed 150,000 as also mentioned before which we reached to through researching how much generally it costs for architectural designing of such big projects. The acquisition cost of the machine setup should also not exceed 90,000 as described in details in contracting. The project should follow the performance deliverables as mentioned in the requirements. * Land area should be minimum of 5 acres. * Should have enough space for an inventory of raw material for 9 days. * Should be able to storage capacity of 20,000 liters of oil. * Should be able to store 520 tons of shredded tires. * Concrete slab should be able to hold the 50-60 ton of machinery & vibrations while working also. * Office should be able to handle a staff of 25-30 people. * The plant should be able to recycle 9 tons of tires per day. * The plant will need an electrical supply of up to 25 KW per day while in operation. * The plant will need water supply of around 6-7 tons per day. * Structure should have enough emergency exists in event of an emergency. * Should have enough fire alarms installed. The plant should able to process 9 ton of recyclable tires with 5 ton of water availability & would take 25 KW amount of electricity. It will produce this much oil, shredded tire, steel wires etc. while in operation. If the architectural contractor is not able to deliver the requirements then there might a trade- off potential to so as to not encounter schedule constraints. If the project faces some scheduling problems then a possibility of trade-off between material supplier is possible. The biggest possibility of trade-offs exist among the aesthetic material in the project like lighting fixtures, air conditioning, plumbing etc. if the project starts to run into budget constraints. After the architectural design has been finished and the required materials have been determined the risk comes into the availability of the raw materials required by amount or by delivery dates. Once all the material required to start the construction has been obtained the availability of manpower required and the machines that will be needed in construction may run into risk on their availability dates. The acquisition team will need to contract the proper contractors around the area to get the structural supplies for the project. For the machinery which have a potential to be delivered through a foreign contractor the risk of schedule and cost may go till the issues of import/export controls have been sorted out on both sides. It is known to everyone very well that majority of the projects run into costs & schedules overruns once the project starts. As we know that we cannot have all the material required for the whole construction in hand beforehand the construction start so it increases a possibility of risk of having cost & budget over-runs. Bidding of the project will be invited by construction companies that are willing to take up this project. A bid will tell us in how much money the construction management company is willing to complete the project. The bidding process will be a closed bidding process. A selection of contractors will be sent an invitation for bid so only they can submit a bid for the project. This selection focuses on the price of a project. Multiple construction management companies submit a bid to the owner that is the lowest amount they are willing to do the job for. Then the company with lowest bid to complete the job for us. This selection focuses on both the price and qualifications of the contractors submitting bids. 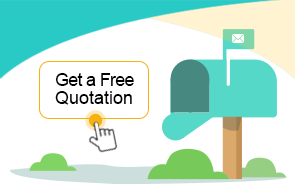 This means that we will choose the contractor with the best price and the best qualifications. We will decide by using a request for proposal (RFP), which would provide us with the contractor exact form of scheduling and budgeting that the contractor expects to use for the project. We will use this selection when we decides to choose the contractor only on the basis of their qualifications. We then uses a request for qualifications (RFQ), which will provide with the contractor’s experience, management plans, project organization, and budget and schedule performance. We will also ask for safety records and individual credentials of their members. The building will be a modular one and it consists of ground-floor and a single storey, having a surface of 200 square meters. In process of time the building will permit a further extension if necessary. The building is located at the plant platform’s entrance, and around this construction will be arranged green spaces, concrete lanes and parking places, in a shapely manner. The construction will be built in heat insulating pre-cast panels adequately to the climatically area where we live. The inside surface’s arrangement and the indoor arrangement will be a flexible one according to the requirements, giving an adequate comfort to the personnel. The building will consist of offices, training rooms, moot-hall and chamber, testing rooms, dispensary having first aid services, mess hall and locker rooms, and it will be equipped with adequate indoor sanitation. The building will be equipped with proper facilities and air- conditioning, access to digital telephony and internet. 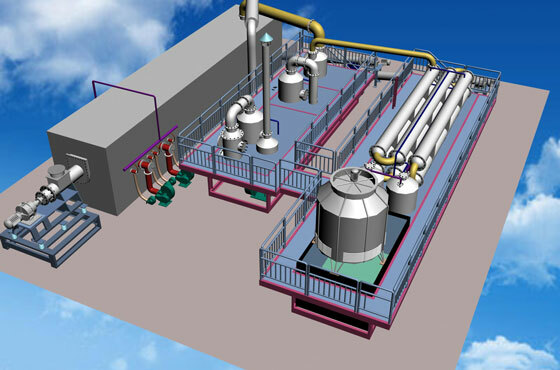 – Surface destined for shredding installation and its deposit for day- Processing, height 9 m, covered surface- Surface destined for granulating and purification, height:9 m in the zone granulating installation 13 m in the zone purification for granules in closed building. – Surface destined for rubber powder installation, height max. 9 m, in closed building- Deposits, height 6 m- Necessary annexes for each plant. The safety equipment is located in an opened space, on a concrete platform having a sewerage system for the catchments of rainwater. The rainwater will be sent in a detention basin which will have an own sewage-treatment and waste-water purifying plant and conformable to the Romanian laws and European laws regarding the environment protection. A. Warehouse of large capacity for entire and shredded tiresB. Warehouse for entire tires, purpose supplying the shredding installation. 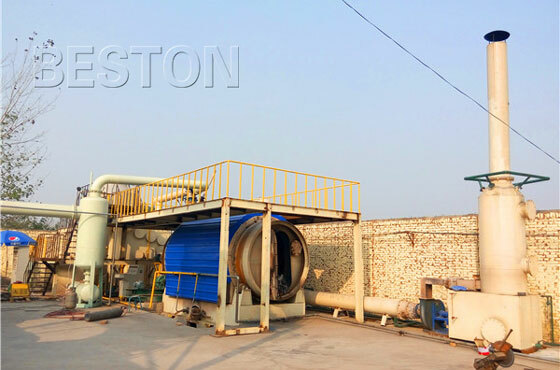 C. Operational warehouse for shredded tires with two compartments, from which the granulating installation is to be supplied. In order to assure a permanent functioning of the installations each of the locations is previewed with a platform of min. 90000 m2, partial concreted. This platform must assure a stock of entire or shredded used tires till annual capacity of processing. Till the putting into operation of installation we will realize a stock of 9000-15000 tones. The shredded tires must be imperative stored on the concreted surface. In this warehouse a special bent shaft for unloading of attachments with cloth. At a distance of 20m from the tire-warehouse/deposit, a shredding installation will be placed on a platform with the surface of 1350 sq. m, height 8 m, with cover/roof. Operative warehouse for shredded tires with two compartments from which the granulating installation is to be supplied. This platform of 1350 sq. m which near by the shredding installation surface and conveying belts is also previewed with two store capacities, having a volume of approx. 290 cubic meters each, where 1500-1800 tones shredded tires of two types can be stored. This indicates the way of equipment spacing and of the store places for shredded tires and assures a continual functioning of installations. Shredding installation will operate only in day- programed assuring the shredded tire stock for the night-programmed. Saturdays and Sundays, as a rule we must have in stock a quantity of aprox.1500-1800 tones. Once the construction has been completed there are specific steps that must be taken to prepare the building for occupancy. · Project punch out: A project punch out means that the project must be looked at for any issues before it is considered completely finished. Issues may include replacing a crackedtile on the floor or changing the color of paint. A list is created containing these issues and itis known as a punch list. · Substantial completion: The architect for the project determines if the building meets every requirement and issues a certificate of substantial completion. This certificate announces the official completion of the project. · Final inspection: A final inspection is done by the building official once the certificate of substantial completion has been issued. · Certificate of Occupancy: A certificate of occupancy is issued by the building official who informs the owner that it is now safe to occupy. This is issued by the building official after the final inspection. · Commissioning: This is the process of testing systems and equipment to ensure that they are working correctly. Then the owner must be trained to properly operate the systems and equipment in the building. · Final documentation: This provides information on the building to the owner for future references. This includes warranties, operation manuals, inspection and testing reports, and record drawings. · Final completion: Final completion occurs when all required paperwork and documentation is completed, including payments to the contractor.